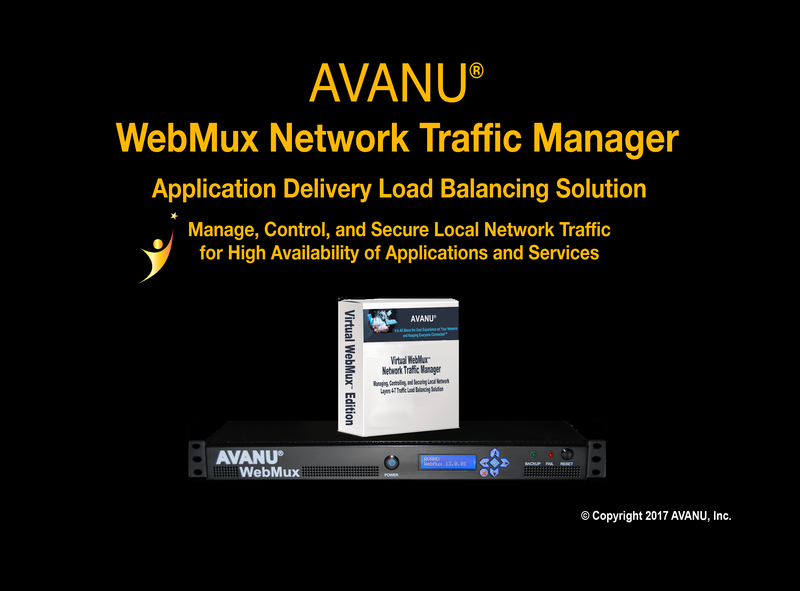 AVANU® announces web application firewall (WAF) features for the WebMux Network Traffic Manager™, an enterprise-class application delivery network load balancing solution. Web application firewall functions have an essential purpose in a network infrastructure. Web sites are rapidly growing with rich features built from interactive applications to enhance the interaction experience for customers. While the applications help increase web site engagements, on the down side these applications open up vulnerabilities and opportunities for hackers to exploit these web sites. The WebMux FireEdge for Apps is a WAF that provides more web application security by monitoring HTTP traffic to and from the backend network servers, detecting and blocking malicious activities. The new WebMux FireEdge for Apps is a standard feature that commences with firmware v13.1 that is available to customers covered under AVANU’s technical service program. Firmware v13.1 is supported on all Virtual WebMux appliances and on the family of network hardware appliance models A400, A425, A500, A525, A600, A620, A625, A725, and A825. “Local network security is a fundamental part for our reliable high performing WebMux application delivery network load balancing solution. We are pleased to be adding FireEdge for Apps as an additional layer of security for our customers”, says Pamela Sun, President of AVANU. AVANU presently offers special trade up pricing to all owners of WebMux including the legacy CAI Networks brand for either the Virtual WebMux for cloud computing environments or to a higher performing plug-and-run WebMux network appliance. AVANU’s WebMux is developed and manufactured in the United States complying with the Trade Agreements Act (TAA) guidelines. WebMux Virtual appliances for Cloud computing environments support VMWare®, Microsoft Hyper-V®, Oracle VirtualBox®, and Citrix XEN® and come with 1-year technical support. The WebMux network hardware appliance models are FIPS-2 Level 2 compliant and come with 2-years product warranty and 1-year technical support. WebMux with firmware v13.1 will begin shipping mid-November. Information can be found at www[dot]avanu[dot]com or contact AVANU by email info[at]avanu[dot]com or by telephone 1.888.248.4900 (United States toll free), 1.408.248.8960 (International). AVANU is a developer of high valued products for the IT infrastructure and data center environments that are cost-effective, full-featured, and high performance. AVANU adds value by placing customers first with a focus on easy product user interface, robust product features, and excellence in customer support services. 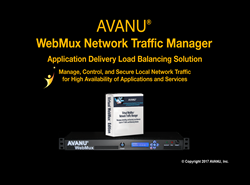 AVANU’s flagship product, the WebMux Network Traffic Manager, is an enterprise-class application delivery network load balancing solution for managing, controlling, and securing local network Layers 4-7 traffic. AVANU® founded in 1997 and based in San Jose, California USA is a privately held network infrastructure product developer with R&D, manufacturing, and production in the United States. Graduated from the U.S. SBA 8(a)/SDB program in 2015. AVANU, WebMux Network Traffic Manager, Flood Control, FireEdge, AVANUAdvantage, AVANews, AVE, BlogWithUs!, DNSMux, MAP are trademarks or registered trademarks of AVANU, Inc. It is all about the user experience on your network and keeping everyone connected is a service mark of AVANU, Inc.